Now in his 18th professional fight, Chiesa has pushed his fandom aside to take on one of the people he’s always looked up to in the sport. Chiesa (13-4) heads into this matchup off back-to-back losses for the first time in his career. After missing weight in a losing effort against Anthony Pettis at UFC 226, the Sickjitsu product knew the timing was right to change weight classes. 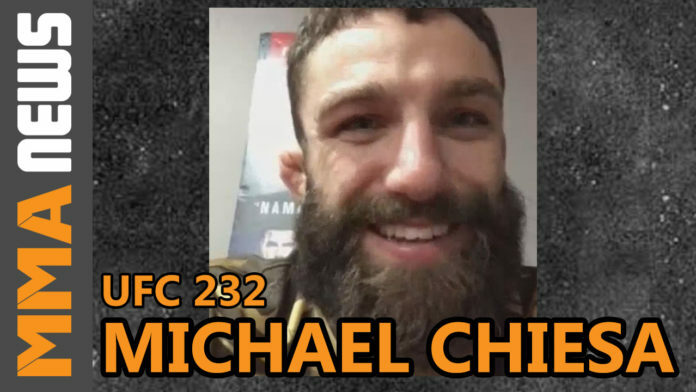 Some added inspiration for Chiesa ahead of this matchup was seeing teammate Austin Arnett pick up his first UFC victory last month on short-notice. Like Chiesa, Arnett also had his back against the wall coming off three-straight losses. The 27-year-old defeated Humberto Bandenay by unanimous decision and gave his team a much needed boost. UFC 232 takes place Dec. 29 at T-Mobile Arena in Las Vegas, NV. The main event is a rematch between Jon “Bones” Jones and Alexander Gustafsson for the interim light heavyweight title.